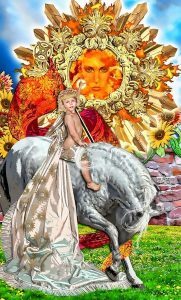 You may notice that our site is graced by some spectacular illustrations of classical Tarot images. These are by my dear friend Erik C. Dunne. Erik, an amazing creator, has traveled extensively, retracing the footsteps of legendary kings and queens, riding camels across the dunes of Persia, and galloping heavy steeds across fields of gold. A classically trained artist, his medium of choice is digital, where he has allowed his passion for costume design and his roots in the theater to lend their resounding voices to each and every card he creates. I have been reading Tarot since 1973. I started with the James Bond 007 Deck (now the Tarot of the Witches), moved to the Swiss JJ, the Aquarian, the Robin Wood, and then for about 20 years read with the Morgan Greer deck. It is Rider-Waite based. The colors were clear and the faces mobile, and it was a great deck for explaining meaning and allegory to my clients. And so I stuck with what I knew, and what was comfortable. Then, in 2013, I was visiting my colleagues Bill Trivett and Bob Hall at their fabulous bookstore, New Visions, in York PA. And Bill, a superb Tarot reader himself, grabbed me and said, “This deck. You MUST see this deck. Oh my Goddess, it is AMAZING!” And he plunked me down and poured into my lap seventy-eight of the most astounding, beautiful, nuanced cards I had ever seen. That’s when I fell in love with the Tarot Illuminati — and very shortly thereafter, Erik and I struck up a friendship made up of equal parts wicked humor, a slightly twisted slant on the world, and massive amounts of mutual respect and love. Erik and I have been friends for over 26 years and his dream of publishing Tarot Illuminati all began when he wandered into New Visions way back then. Now his dream is realized. My greatest pleasure and honor was to personally place his own published deck into his hands for the very first time. The day we received the deck at New Visions from Llewellyn, I called Erik up and we planned to meet at my house that evening. So there on my porch I presented him his deck. Up to that moment he had not seen the finished product. He was stunned. We laughed, we cried, we had cocktails. A most memorable event for both of us. Not only is the artwork of the Greater Arcana lush in its beauty and design, but Erik’s decision to make each of the Minor suits a specific culture — Wands as Middle Eastern, Cups as Russian/Scandinavian, Pentacles as Asian and Swords as Elizabethan England — gives additional depth to the readings and clues to the client as to what lies ahead as a spread unfolds. The colors, the loving attention to detail, the liveliness of expression on all the faces invite any reader, from rookie to longtime professional, to fall headlong into the card and discover new interpretations and new meanings. 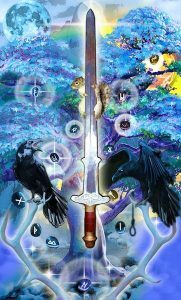 Erik has also just completed a second deck, the TAROT APOCALYPSIS, which will be published by Lo Scarabo (the ILLUMINATI publisher) in 2016. Another collaboration with author Kim Huggens, this deck is inspired by ancient cultures and mystery religions. From the cult of Inanna in ancient Sumeria and the Eleusinian mysteries of ancient Greece, to the rites of Indian aghoris in the cremation grounds as they worship Shiva, each Major Arcana card presents a mystery religion of the ancient or modern world. 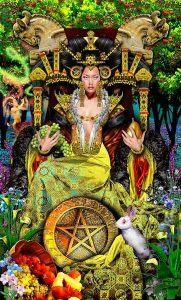 Here the teachings of those mysteries are revealed through the Tarot. In the Minor Arcana we travel across the frozen tundra and forests of pagan Scandinavia, through the red deserts of ancient Egypt, walk among the beauty of classical Greek and Rome, and experience the majesty of Khmer Empire. The Court Cards are presided over by deities important to these cultures, and here we find wise Odin, nurturing Lakshmi, powerful Horus, alluring Aphrodite and more.